Tata understands the nuances of all aspects of social presence from planning to development to execution. 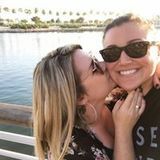 Starting out by working with a handful of brands and single handedly growing significant user communities based on her unique process and increased engagement measured in likes/shares to all time highs for her clients. As the demand increased she cultivated a team of like minded go getters who work under Tata to deliver the To The Moon Socialâ&#x20AC;&#x2122;s vision as created for each individual brand. Meet Tata Tickaradze, a seasoned expert in the social media and branding space, working with big box brands like Eyeko to emerging brands like Good Catch Foods to strategize, plan, and implement social media and branding campaigns as well as take on day to day engagement and execution. The To The Moon Social team represents over a dozen brands. We are experts, creatives who are passionate about elevating stories in the digital space. Our digital agency cultivates and elevates your brand voice by innovative storytelling with a team of strategists, content creators and copywriters. We drive meaningful social engagement with your target audience while building a beautiful brand that encapsulates your high-level vision though our strategic social media development, management and curation. 01 Founder Tata Tickaradze is a social media brand expert specializing in Strategy, Planning, Execution and Engagement. A skilled marketer who understands the nuances of all aspects of social presence from planning to development to execution, Tata is the secret weapon when it comes to social media programming and engagement. Â She has single-handedly grown significant user communities based on her time-honed process. Tataâ&#x20AC;&#x2122;s knowledge of content and delivery has been critical in the launch of major brands and professional services alike. 02 Amber Hukari is a forward-thinking creative services guru based out of sunny Los Angeles, California. SheÂ literally eats, sleeps and breathes all things creative, design and social media. After years of being in the corporate world working to make someone elseâ&#x20AC;&#x2122;s dreams come true, she finally decided to take a leap and make her own dreams come true. She specializes in creating jaw-dropping web and social presences for her fellow lady bosses (#girlpower) by designing custom brand packages, websites, and crafting killer social strategies that help get audiences talking. When she isn't working behind the scenes, you can find her snuggled up with one of her six fur babes or planning her upcoming wedding! WHAT WE DO We work with photographers and videographers to bring your brands esthetic to life through imagery made specifically for your social channels. We post to your social channels six days a week (Monday through Saturday) to ensure that your audience is getting maximum reach. • Instagram management, • daily posts, • Instagram stories content curation, • captions and • hashtags. PLUS: As an added bonus we also throw in our Instagram Growth Hack free of charge! Our To The Sun Package is our second tier add on package. In this package, you will receive everything from our To The Moon Package, our To The Clouds Package PLUS: â&#x20AC;¢ Content creation in the form of styled photo shoots (either lifestyle or product) for your brand! Our To The Stars Package is our third tier add on package. In this package you will receive everything from the packages listed above PLUS: â&#x20AC;˘ Facebook and Instagram ads management services! This is the package that allows you to really get the most eyes on your account in the shortest amount of time! Our To The Galaxy Package is our most robust and all encompassing package. In this package you will get everything listed in the packages above PLUS: â&#x20AC;˘ visual brand identity overhaul and a â&#x20AC;˘ full customized website Both your brand and website are designed to convert your audience once they leave your social media and move to the web! Need even more help? We can send Tata to you! Â With your inperson training you will get a full audit and training for your entire social media team.Â We will dive into your account and come prepared with a full day training session to help your team understand all the current social media best practices, tools, and strategy needed. Top Seller! 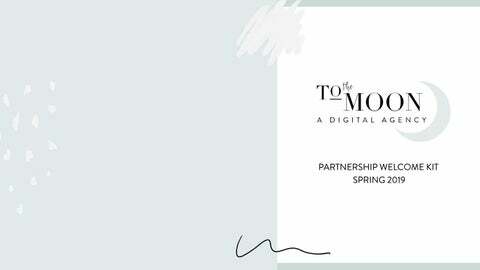 To the Moon Social is proud to work with some of the hottest brands in beauty, lifestyle, food and media industries. Since launching Good Catch Foods social channels in March 2017, To The Moon Social has developed a social content strategy that fully immerses the digital consumer into the experience on the huge mission behind Good Catch Foods. With a particular focus on Instagram, To The Moon Social created a balanced feed with a mix of mission based posts, product posts, and curated user-generated content bringing the on- mission experience of grandeur in the digital presence. Recent photoshoots have focused on capturing the many ways Good Catch Foods plans to help educate the audience about nutrition, healthy oceans and marine life as well as capturing delicious chef inspired recipes. Since launching the social accounts (comparing March 2017 to February 2018): • Facebook audience growth of 137%* • Increased Facebook monthly engagement by 880% • Instagram audience increase of over 25%* • Increased Instagram monthly engagement by 374%. Since taking over Eyekoâ&#x20AC;&#x2122;s social media channels in September 2016, To The Moon Social developed a social content strategy that fully immersed the digital consumer into the beauty industry of all things Eyeko and eyes. Focusing on Instagram and Facebook, To The Moon Social reframed Eyekoâ&#x20AC;&#x2122;s story telling, aesthetic, CTA and curated usergenerated content for the brand. To The Moon Social was able to grow their Instagram account from 109k - to 130K followers within 3 months while managing their account through influencer programs and partnerships. Since taking over Stay Boutique ( Boutique & Lifestyle Lodging Association ) channels in August 2016, To The Moon Social developed a social content strategy that fully immerses the digital consumer into the Stay Boutique experience. With a particular focus on Instagram, To The Moon Social reframed Stay Boutique’s feed with a mix of original luxury and lifestyle photography, and curated user-generated content bringing the on- property experience of grandeur and a Sense of Place philosophy to the BLLA digital presence.